Needed a new baby card, but decided not to invest in a baby set, as I don't need baby cards very often. Looked through the stash and came up with this fun die from Hero Arts Balloon Animal Birthday. Also used a sentiment from a Hero Arts messages set, twine, Altenew Buttercream ink, and a custard card from Memory Box (a perfect match with the ink). It is easy to use your dies to make faux letterpress, but you'll need a few other supplies (which I bet 99% of you already have). I followed the directions from this outstanding video by Katherine Shudrova (although I admit that I did not roll the stack of dies through the Big Shot as many times as she does). I'm hooked on this technique. If you decide to use it, let me know as I'd love to see your work. This is adorable! I've always wondered how to do that -- going to check out the video. Thanks! I love the look! I foolishly gave away my tan mat when my Grand Calibur broke. What was I thinking? More shopping. 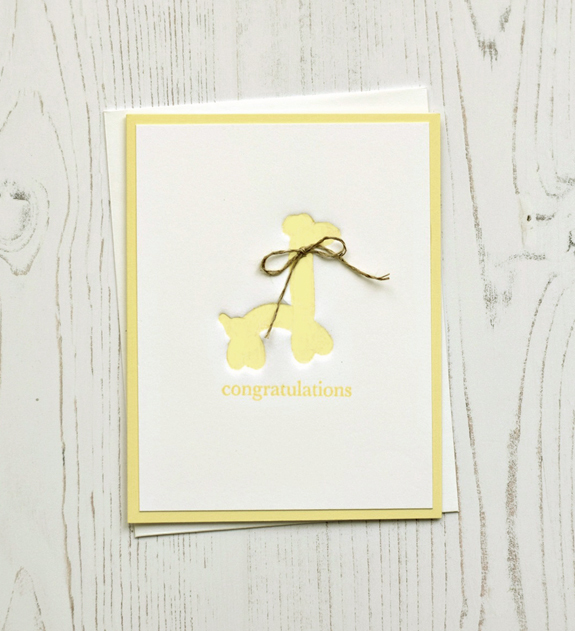 This yellow is very pretty and it's perfect for a baby card. What a cool technique! Thanks for sharing your lovely card as well as the link to the video. Not sure I have the patience for the technique but maybe after a glass of wine? Love this sweet card! Will need to take the time to watch the video because I love classic high quality paper things, and your card looks custom printed. Absolutely adorable ... off to check out this technique.